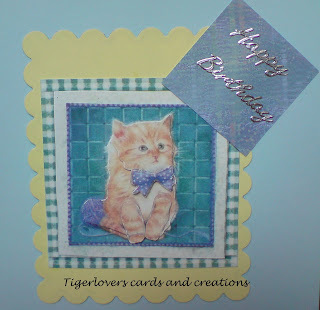 Decoupage - Either original decoupage, 3d decoupage, die cut or stamped images or any other interpretation, Layer it up ! 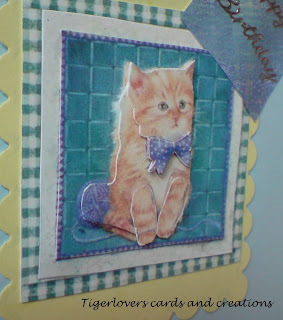 And here is my card entered as my DT entry into the challenge. Hope you like it and it gives you some inspiration to join us. It is a card I made for my friend who is celebrating her 11th birthday this weekend. She loves cats, so I thought this one would be an appropriate card for her. 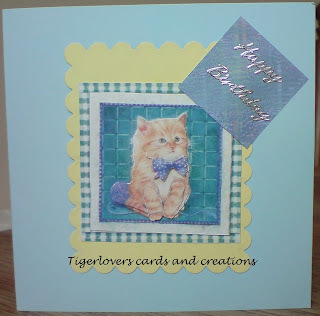 The design of the card is my own, I did everything myself after my mum cut out the decoupage image. Hope you like it. Thank you for looking, all comments very much appreciated and very welcome. And don't forget: join us at C.R.A.F.T. Challenge this week.